EXCLUSIVE Make fantastic side dishes in these smooth, non-porous porcelain dishes. Create a classic soufflé or whip up mac ’n’ cheese, baked eggs, cobblers, crème brûlée and more. Boasting a classic ribbed design, our exclusive ramekins are available in multiple sizes to suit your full repertoire of recipes. 1 oz. : 2.4" x 1.3"
2 oz. : 2.8" x 1.4"
5 oz. : 3.5" x 1.9"
7 oz. : 3.9" x 1.8"
10 oz. : 4.5" x 1.8"
13 oz. : 4.6" x 2.6"
Safe and proficient shipping. Items arrived without any chips or cracks. Well crafted, and absolutely perfect size for my Sticky Toffee Puddings, Creme Brulee, and Bread Puddings! Love them! Lovely for my pumpkin custard. These are just the right size and fit neatly in the dishwasher. With the clean design and white color, they go with everything. Great for Carnation Milk recipe for Creme Brulee. I was able to find storage in a drawer because they don't stack more than two high. Received my order of 13 oz ramekins recently. I'm going to use them for chicken pot pies.. Mmm. OR, maybe apple crisps... Either way, they seem to be the perfect size and I am anxious to use them. Two stack nicely, so they store in less space. I ordered these in two different sizes but when they came, I measured out water into both of them and they are within a fraction of an ounce of being the same size. The items are quite nice in themselves but I'm still very disappointed. Because I only had 4 of them on hand and I needed 6 for the recipe. And the quality is of the best I have found. Wedding Registry and a very handy thing for your kitchen. Purchase two of the 7 oz at the store in Alexandria and decided to order more of those and some other sizes to use on our Pit Barrel Cooker for side dishes. Looking forward to making individual servings of french onion soup! Need size 12-14 oz. ramekins. Hard to find in stores locally. Compared well in size, price and quality to others that were higher in price. Will review quality when I receive the shipment. I have recipes that call for this size Ramekin. While they were on sale I took advantage! Because my cat knocked my last ones out of the cabinet and broke them, and these were a good price. Needed additional ramekins this size. Perfect for my homemade individual pot pies! I already have some; they are so useful; I wanted more. These look beautiful, well made and are microwave safe. I wanted to make individual desserts. J'ai besoin d'eux pour ma cuisson de Noël. These will make a great gift (we are giving a set of 4 each) for our private party cooking classes that our company is doing for our top clients. The menus include a soufflé or caramel creams, both of which the chef agreed would be nicely served in these. The classic, clean lines will be appreciated by our guests! Good for desserts and food prep. have some already and love them, broke one! I have learned how to make flan and will be learning about Citron souffles. These ramekins will be used frequently to serve half-cup portions of desserts. I couldn't fine ramekins in my area and the price was great. I have always admired my mothers. I've been looking for these and finally found some that are larger than 10oz size. For chicken pot pie. Fingers crossed. Im a Corporate Flight Attendant and we use these for condiments on our planes. It is easy to heat up left overs in these Ramekins, as well as add some sauce and use them for dunking food into, during a meal. Most manufacturers only offer larger ramekins. These small ones are great for one scoop of ice cream. For Thanksgiving dinner with the family. I never seem to have enough of these -- I use them for everything from individual sauces at each place setting to small lava cakes for dessert. They can do anything. Perfect for summer berry individual cobblers or souffle's. Had purchased these mini ramekins before, and they are the perfect size to place my vitamins during breakfast time. Easy and pretty to use. Perfect size for condiments, custards, etc. What are the dimensions of the 1oz ramekin? BEST ANSWER: The 1 Ounce Ramekin has a 2.4 inch diameter and a 1.3 inch height. What are measurements of the 7 oz ramekin? What are the measurements, height and width across, for the 5oz Ramekin? What is the dimension of the 13 oz ramekin? BEST ANSWER: Yes, all of our dinnerware is lead and cadmium free. i don't have any certification of that. However, because they are sold in the USA specifically for food I have to assume they are lead free. I don't believe any cook or serve ware is allowed to be sold in the USA if it contains lead. Decorative items are labeled that they contain lead and are not to be used for food. why does Sur La Table measurements of 5 oz and 7 oz ramekin with ribbed sides differ from customers' responses posted here? BEST ANSWER: I have 7 oz. 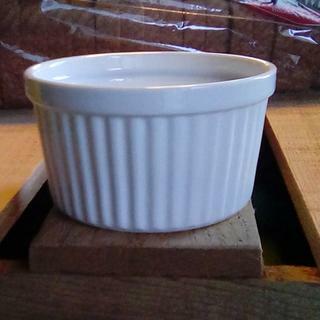 ribbed ramekins--they hold 6 oz. of liquid to the very top rim. They are 1 3/4 inches high and are 3 3/4 inches across the top, and 3 inches across the bottom. I am not sure I answered the why part of the question, but these are the facts.